Dataguard Solutions Ltd have developed a revolutionary and patent pending conformal coating that eliminates the problems caused by zinc whisker contamination in the data centre and other environments. The development work for this product was originally conducted in conjunction with the US Government Department of Defence. This coating is called Dataguardian™ and it is the cure for zinc whiskers in the data centre. If you have ever been involved with a data centre that has had a zinc whisker problem, then you will be all too well aware of the problem that they can represent. If you have ever experienced intermittent problems involving unexplained server failures following routine maintenance, such as moving floor tiles or other physical works in your data centre, then you may have a zinc whisker problem. These failures are not necessarily coincidental, and may well indicate a zinc whisker problem. A zinc whisker may typically be a micron (a micron is a millionth of a metre, a thousandth of a millimeter) or two in diameter, and up to ten or more millimetres long. 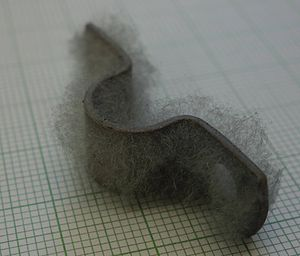 Given their physical dimensions and light weight, these zinc whiskers are easily detached from the zinc substrate to become airborne conductors. These conductors are more than long enough to bridge between components and adjacent conductors in any server or modern electronic component. They often become airborne following a physical activity in the data centre, such as moving floor tiles. Their presence may well be indicated by an immediate rise in failures following the physical activity. The very same airflow that provides cooling to the servers carries these fine particles right into the heart of the electronics, causing the increase in failures mentioned earlier. Confirmation of the presence of zinc whiskers may be readily confirmed by physical examination of the galvanised components in the data centre. At this stage the only solution is to deep clean the data centre to remove the zinc whisker contamination. There is of course an absolute certainty that following the deep clean the zinc whiskers will return; the only question is how long the re contamination will take. When the zinc whiskers do inevitably return another deep clean will be required, bringing all of the disruption and additional costs associated with it. Previously the only long term solution to zinc whiskers was to replace all affected galvanised materials with ones that would not grow whiskers. This is clearly a highly expensive solution, requiring even more down time in the data centre. Short term remedial solutions involve deep cleaning of the data centre to remove all zinc whiskers from galvanised surfaces. The deep clean itself involves significant cost and causes significant disruption to services. Dataguardian™ offers a long term remedial solution to the problem of zinc whiskers that may be applied during the deep clean necessitated by the discovery of the zinc whiskers. It is highly cost effective, relatively simple and long lasting. Dataguardian™ is a conformal coating which is designed to eliminate the problem of zinc whiskers from galvanised surfaces for a life of in excess of 20 years. It can be applied to new galvanised surfaces, or to old galvanised surfaces following the remedial deep cleaning required to remove the zinc whisker contamination. Application is very similar to painting an emulsion (or latex) paint, with similar minimal health and safety precautions being required. Application may be by brush, spray or roller as appropriate. A single coat of Dataguardian™ will offer a suitable dry film thickness of product to offer protection against zinc whiskers for a period in excess of 20 years. To discover more of the history behind the discovery of metal whiskers, and the research work behind Dataguardian™, click here. To discover more about Zinc Whisker Remediation in the data centre, click here. To find out more about protecting your data centre from zinc whiskers with Dataguardian™, please contact us.